We have a little space at home for gardening, and keep a patch of kitchen herbs under the Meyer lemon tree. 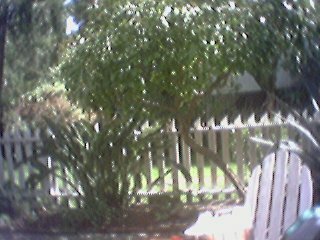 Yes, those amazing things to the left of the Meyer lemon tree are stalks of Bird of Paradise flowers, and just behind the adirondack chair on the right of the tree is a huge agave! ...only in California... 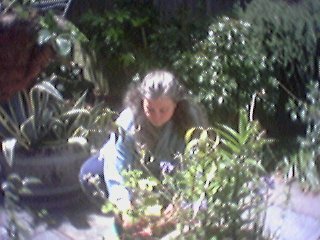 The next photo is Lise, dabbling in the planters in the back yard. Who could resist an acronym like SLUG? Alas, as of July, 2003, SLUG is bankrupt, and the various regional gardens are once again on our own, or back under Park & Rec, or in some cases, buying their land outright. We have a plot each out in one of the many community gardens that predated the umbrella organization of SLUG, and connect with the other gardeners through a handful of meetings throughout the year, on the grounds of the Sally Brunn Noe Valley Branch of the SF Public Library. There are funds through a recent bond issue for upgrading and earthquake retrofitting the library, which will begin in the summer of 2004; the final disposition of the garden is still up in the air, but it looks like there will still be room for some gardening, and certainly landscaping that has been done by community members over the past 23 years, there. It's a warm and active, if small group of us. We grow flowers and vegetables that we know we love, and each year try a different experimental crop: one year we grew a small patch of oats, one year it was fava beans, which flourished, and soybeans, which didn't come up. The patch of French Sorrel continues to thrive, and a few cannas that were sent out of the blue by a gardening friend, are growing and blooming in profusion in the narrow strip of soil between the walk and the brick wall. We're in the fog belt here, which means that our warm and cosy seasons are spring and fall, and in the summertime, true to Mark Twain's quip about his coldest winter in California being a summer spent in SF, the rising air of the hot Central Valley pulls cool air in from over the water, bringing a blanket of fog up over our heads. This means veggies that like long hot days don't do well here - we cannot grow a tomato, for instance. What grows splendidly here are peas and beans of all kinds, lettuces and greens of all kinds (we especially love chard), herbs, and flowers. These pages are a work in continual progress. Created 6/1/2002, most recently updated 08/18/2003.